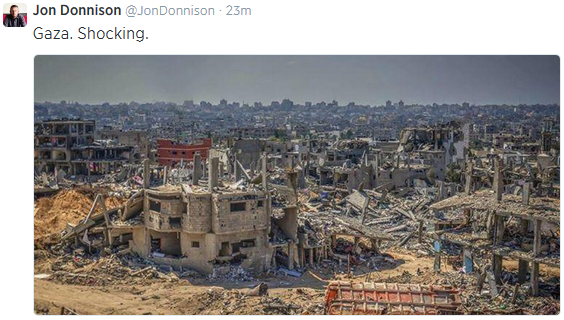 He really is a piece of work, the BBC's Jon Donnison. One of the most perceptibly and persistently biased of all the BBC's Middle East correspondents, he has countless times been shown up for the egregiously prejudiced and under-informed reporter that he is by the incisive and knowledgeable Hadar Sela of BBC Watch. Indeed, Al Beeb's former Gaza correspondent, who was sent back there from Sydney to cover Operation Protective Edge, seems never to have quite come to terms with his new billet here in Australia. Among his numerous tweets (some of them of puerile schoolboy standard that not only let him down, but also, I should have thought, the BBC) are many regarding Gaza and Israel; no prizes for guessing the comparative twists. Indeed, a sticky post on his Twitter page big-notes the photos he took when last there; you can guess their thrust. Too many of his reports from and comments about Australia are flippant and shallow. Donnison seems to have made little effort to delve deeply into Australia's history and politics, preferring, it would appear, to rely on gleanings from left-wing sources including leftists with Twitter accounts. His latest piece is a typically superficial and partisan one about Australia's "stop the boats" policy, by which illegal mainly economic migrants wanting to jump the established immigration queue fall victim to international people traffickers, and which in typical leftist style he interprets as the unconscionable response of a heartless government backed by racist people. (I wonder whether he realises that the long defunct "White Australia Policy" to which he refers in the article originated less in racism than in the fear that uncurbed migration from South-East Asia was inexorably driving down workingmen's wages.) And, true to form, he manages to make Gaza and the Gazans a feature of the piece. Twitter, indeed, appears to encourage lazy journalism, and lazy journalism is what many of Donnison's critics consider a failing of his: witness, for instance, this. It seems a given that BBC staff scan and cite the Guardian and Ha'aretz for news of Israel, to the virtual exclusion of centrist and (perish the thought!) rightwing media (except to disdain or mock the latter's content). Preferring leftist sources, which in Australia's case means the Fairfax Press and not Murdoch 's News Corp is, evidently in almost every Beeboid's DNA. 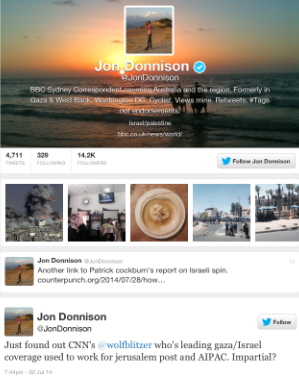 Donnison's recent dismissive tweet about the article in Ha'aretz on antisemitism in Australia by former Australian Jewish News editor Dan Goldberg which originally appeared in the latter paper is a probable example of Donnison's mindset. "Australia is not afflicted by the same degree of anti-Semitism reportedly sweeping Europe, but there is a “palpable level of concern” among Jews here following a spike in anti-Semitic incidents since the Gaza war broke out seven weeks ago, some Australian academics warn...."
and it took care not to accentuate the problem. 'There have also been several physical assaults on Jews here, but the torrent of anti-Israel and anti-Semitic abuse has come from the sewers of social media. “There has been a seismic shift,” said Prof. Mark Baker, director of the Jewish center at Melbourne’s Monash University. “It’s as though the images that we once viewed on television have popped out of the computer screen and landed in our bedrooms. “People feel as though they are living inside the experience of ISIS beheadings, anti-Israel demonstrations and the Gaza Israel war,” he told Haaretz. 'Zeddy Lawrence, the editor of the Australian Jewish News, agreed there was a “palpable sense of concern” within the Jewish community, but did not go as far to suggest the community is in a tailspin. 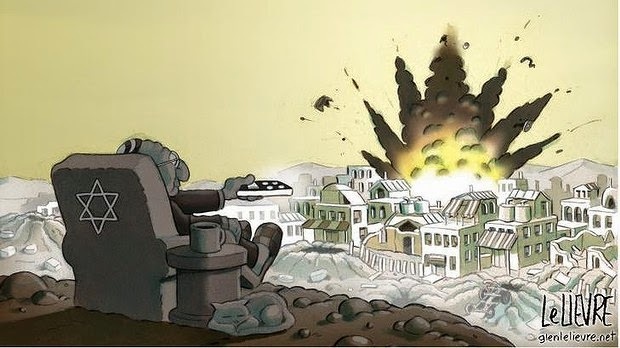 I suspect the mention of the media, which invoked memories of the disgraceful Mike Carlton article in the Fairfax Press and its accompanying odious cartoon (above, right) prompted Donnison's dismissive attitude, because it wouldn't do for a Beeboid to concede antisemitism on the part of fellow journalistic leftists indulging in a spot of Israel-bashing, now, would it? Indeed, I seem to recall that Carlton or someone of his ilk gleefully retweeted this example (right) of what passes for Donnisonian wisdom. And I've a hunch that a piece by a Muslim editor on his community's concern about increasing "Islamophobia" in Australia would not have been so cavalierly treated. '....Two weeks ago in this paper, an anonymous Israeli declared shame in her citizenship. I'm proud that she has the right to do this, and can do so safely, both here and in Israel. However, her anonymity was insulting. 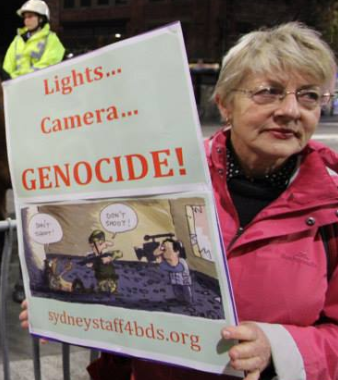 Australia and Israel is not Gaza or Nazi Germany. 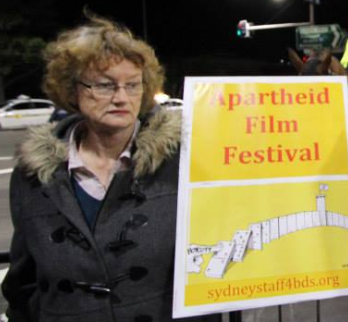 Israelis and Australian Jews can, and do, criticise Israel. Although I'm sad that it has been forced to do so, I'm really proud that Israel has invested billions of dollars on bomb shelters and air-raid sirens and radars to detect incoming rockets and missiles to shoot down those rockets, all in the name of protecting its people. 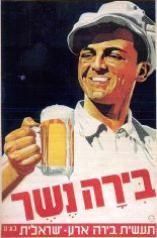 I'm proud that I could do my small part in protecting other Israelis by serving in the army. The army consists of people just like you and me; people who would prefer to start their adult life earlier, but understand the importance of defending their country. That said, I hated the idea of fighting Palestinians. For, whether we like it or not – or they like it or not – Israelis and Palestinians share a homeland. We could fight each other for another few generations, or we could divide the land so both sides have a state. I'm proud that successive Israeli governments, buoyed by majority opinion, have been willing to do just that. We have engaged in peace talks, we have made offers. I know there are Palestinians who also want to stop fighting. I don't know how many, because their media remain full of calls for Israel's destruction, many of their politicians describe Jews as sub-human and their leaders keep turning down Israeli peace offers. 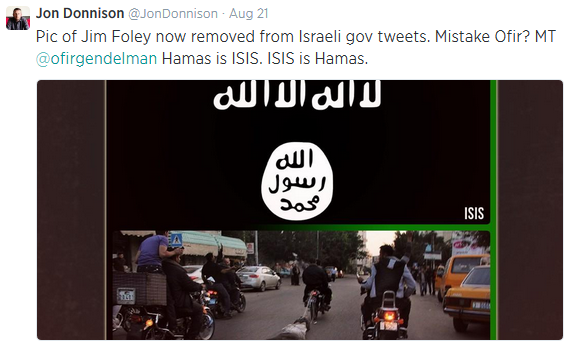 What I also know is that Hamas hates me – not because I'm an Israeli, but because I'm a Jew. 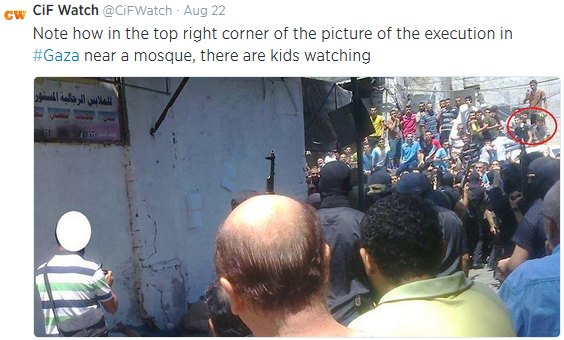 I know that Hamas sees itself as being in an inter-generational war with my people. That is why it launches rockets and digs tunnels to provoke fighting with Israel. Not because it thinks it will win, but because it thinks that, after another 10, hundred, thousand such rounds of conflict, the Jews will find somewhere else to live. Well, we won't. And while I'm proud that the Israeli army does what it must to protect Israelis, it breaks my heart when innocent Palestinians die. I believe that their deaths are the result of Hamas's unbelievably cynical tactics, and I'm proud of the lengths to which Israel goes to prevent Palestinian casualties...."
Recently, in this land Down Under, the Uniting Church (which, incidentally, is not renowned for love and affection towards Israel) held an interfaith meeting on the illustrated theme, coined in response to the "We'll fight radical Islam for 100 years, says ex-Army lead Peter Leahy" headline that which appeared in The Australian on 9 August. He said radical Islamists intent on a new world order were already a threat to the survival of nations in the Middle East and Africa. If the declared caliphate in Syria and Iraq survived, bases would be established there for attacks on the West and that would embolden “home grown” radicals to attempt attacks in Australia. Military action would be needed to eliminate the threat. 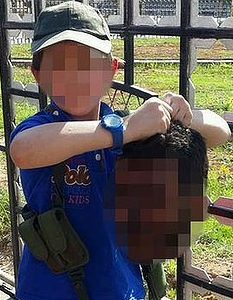 All pretty sensible stuff, we may think, particularly in view of the number of Islamic fighters from Australia known to be fighting abroad, including the father of the seven-year-old pictured recently holding a severed head. But smacking of "media vilification" in the minds of the above-mentioned conference (at which a rabbi, the not widely known Zalman Kastel of Sydney was present) and its supporters, apparently. 'As people committed to building a healthy, cohesive and diverse communities in Australia, we have observed with dismay and empathy the way our Muslim friends have been affected by the language and tone of recent political statements and media coverage. We agree with the concerns of Muslim community leaders that the language and policies of our leaders should not marginalise or vilify people of Muslim faith, and that rhetoric used in relation to Australian security and conflicts around the world should not cause further division in our society, or make anyone feel alienated from the nation they call home. We believe people of Muslim faith are being unfairly smeared in the eyes of the Australian public by both subtle and overt links to violent extremism in political and media discourse. We know and understand the deep concern and hurt this is causing to our Muslim friends and the risks this kind of generalisation has for social harmony and cohesion. The violence and values of extremists like ISIS are not representative of the vast majority of Muslim people in Australia, who are characterised better by their commitment to peace, community and mutual respect. We stand in solidarity with all people who are suffering the results of war, violence and terror around the world, recognising the dignity of all people and their right to enjoy freedom from persecution and oppression. We celebrate the diversity of the Australian community and recognise the valuable contribution of people of Muslim faith to our culture and community. 'Muslim and Jewish leaders have united in calling for stronger collaboration between their communities in the wake of the Gaza conflict. In an unprecedented joint statement, the Board of Deputies and the Muslim Council of Britain condemned civilian deaths as tragic and called for efforts to avoid them. They also condemned any expression of antisemitism, Islamophobia and racism generally, calling on both communities to “redouble efforts to work together and get to know one another”. But the statement was not without controversy, with both sides unable to agree the exact meaning behind one key line. 'It is hard to exaggerate the stupidity of the UK Jewish Board of Deputies in what it has just done. It has signed a joint statement with the Muslim Council of Britain condemning antisemitism and Islamophobia and urging that the Middle East conflict should not prevent good community relations in Britain. Apart from the false equivalence between antisemitism and Islamophobia, which equates a metaphysical global derangement – the cause of centuries of pogroms and genocide against the Jews – with a spurious thought-crime invented to silence legitimate criticism of Islam, these were unexceptionable pieties. "The death of every civilian is a tragedy, and every effort should be taken to minimise such losses. The targeting of civilians is completely unacceptable and against our religious traditions." 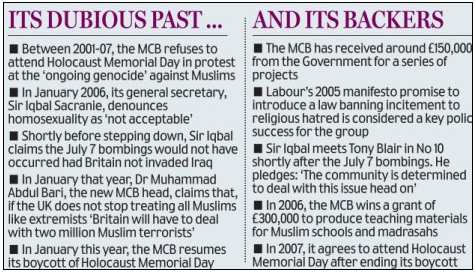 The MCB is an umbrella organisation, a number of whose member groups are aligned with the Muslim Brotherhood and support Hamas. The Board of Deputies may have assumed the second sentence above could only refer to Hamas, since the IDF does not target civilians and goes to great lengths to avoid hurting them wherever possible. 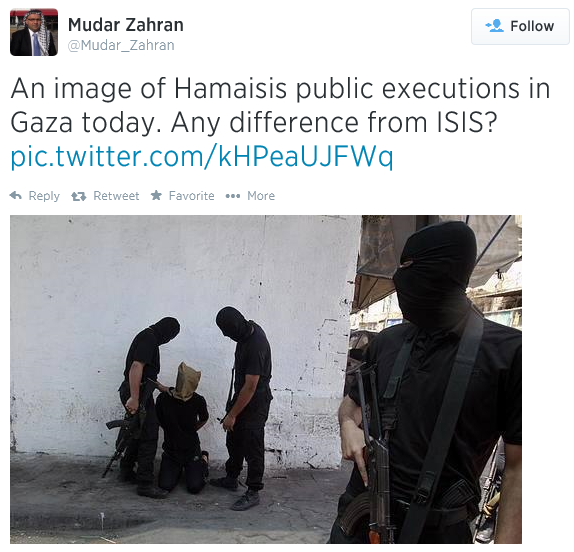 But there is no way the MCB would ever suggest that Israel behaves honourably while Hamas does not. It should therefore have been blindingly obvious that the MCB would do what it has immediately done – claim that the Board had agreed with it that both Israel and Hamas had targeted civilians. The Board has thus now enabled the MCB to claim that the UK's Jewish community leadership has condemned Israel for targeting civilians. Unbelievable. But that's not the full extent of it. The Board seems to be proud that this joint statement is an "unprecedented" achievement. But just look at its new friend. MCB leaders have in the past strongly supported Sheikh Yusuf Qaradawi, the spiritual leader of Hamas who supports suicide bombings against Israelis (and previously, British forces in Iraq) and who has also asserted that the Torah permits Jews to spill the blood of others and seize their money and land. The MCB boycotted Holocaust Memorial Day, for which it was shunned by the British government until it ended its boycott. In 2009, its then deputy secretary general, Daud Abdullah, signed the Istanbul Declaration which threatened violence against Israel supporters and British troops. In 2005, it offered its condolences to the family of the leading Hamas terrorist Abdul Aziz al Rantissi after he was killed by the Israelis. Its former Secretary-General, Sir Iqbal Sacranie, branded Israel a "Nazi" state, accused it of "murderous leadership", "Zionist brutality" and "the ethnic cleansing of Palestine", and compared Hamas suicide bombers to Nelson Mandela and Mahatma Gandhi. Also that year, the BBC TV Panorama programme exposed the influence on the MCB of the Islamist thinker Sayed Maududi, who preached the need for jihad to bring abut the "universal revolution" of Islamic state rule. In short, it is beyond astounding that the Board of Deputies should have had anything to do with the MCB at all. Its action has also dealt a blow to all who are struggling to deal with Islamic extremism in the UK. For at a stroke the MCB, which in any sane universe should be shunned as a threat not just to Jews but to Britain, has been awarded a kite-mark of respectability and decency by – of all people – the Jews. 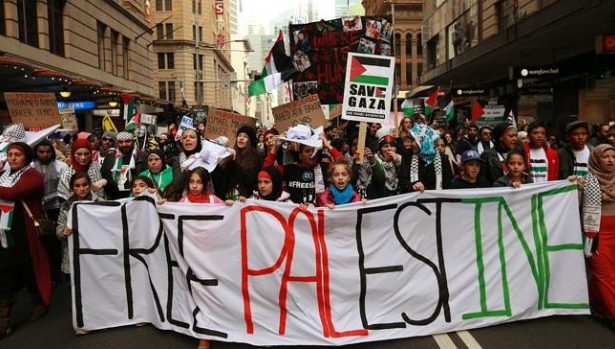 Entitled "Palestine – Unearthing Past Remains Key To Resolving Future", this is the latest article by Sydney lawyer and international affairs analyst David Singer. The cease fire agreement ending hostilities in the Fifty Day War between Israel and Hamas marks yet another milestone attesting to the failure of Jews and Arabs peacefully to resolve their claims to sovereignty and self-determination in the territory once called “Palestine”. Amazingly, the continuing inability of the parties – and the international community – to reach consensus on identifying when this long running conflict actually commenced, ensures it will continue to remain unresolved. Emeritus Professor Richard Falk – formerly United Nations Special Rapporteur on Palestinian Human Rights in the West Bank – still claims in his latest article that the conflict started in 1947. “The Israel story is framed in the same terms that have been in use since the early 1990s—the quest for a “two-state solution.” It is accepted that the conflict is “Israeli-Palestinian,” meaning that it is a conflict taking place on land that Israel controls—0.2 percent of the Arab world—in which Jews are a majority and Arabs a minority. The conflict is more accurately described as “Israel-Arab,” or “Jewish-Arab”—that is, a conflict between the 6 million Jews of Israel and 300 million Arabs in surrounding countries. (Perhaps “Israel-Muslim” would be more accurate, to take into account the enmity of non-Arab states like Iran and Turkey, and, more broadly, 1 billion Muslims worldwide.) This is the conflict that has been playing out in different forms for a century, before Israel existed, before Israel captured the Palestinian territories of Gaza and the West Bank, and before the term “Palestinian” was in use. Adopting Friedman’s viewpoint over Falk’s, one can confidently nominate the 1920 San Remo Conference as the legal basis for founding the State of Israel – when England, France, Italy, and Japan agreed to divide the areas of the 400 years old Ottoman Empire conquered by them in World War 1 into three mandates: Mesopotamia (now Iraq), Syria/Lebanon and Palestine. This carve-up was intended to see Arab self-determination eventually achieved in 99.99 per cent of the conquered Ottoman territory and Jewish self-determination in the remaining 0.01 per cent. These proposals were unanimously endorsed by all 51 member States of the League of Nations in 1922. 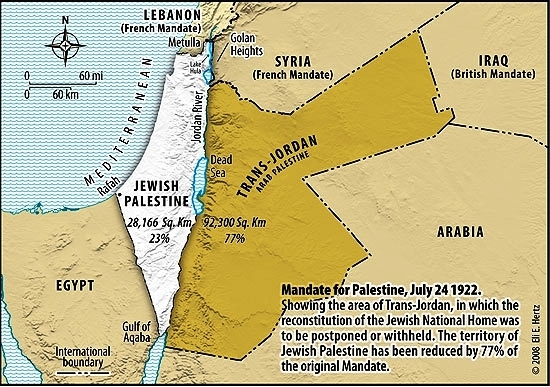 But they proved to be temporary only in relation to Palestine – because three months later the provisions of Article 25 of the Mandate for Palestine enabled Great Britain to restrict the reconstitution of the Jewish National Home to within 23 per cent of the tiny area of land originally set aside to achieve that objective at San Remo – with the remaining 77 per cent of Mandatory Palestine eventually becoming an independent Palestinian Arab state in 1946 – that is today called Jordan. The period 1920-1947 without doubt covers a host of critically important legal and historical signposts that cannot be forgotten or buried. Whilst the two-state solution ultimately created between 1946-1948 as a result of the San Remo Conference is ignored – attempts to resolve sovereignty in today’s highly volatile West Bank and Gaza – are destined to certain failure and renewed conflict. The two-state solution posited by the Oslo Accords and the Bush Roadmap creating a 22nd independent sovereign Arab State in the West Bank and Gaza between Jordan and Israel for the first time ever in recorded history has failed to materialize – despite twenty years of intensive political and diplomatic efforts by the international community. The PLO (founded in 1964) and Hamas (founded in 1987) both seek to unravel the decisions made at San Remo in 1920. They need to be replaced as Israel’s Arab negotiating partners by the two successor States to the Mandate for Palestine – Jordan and Israel – and possibly Egypt – to determine and allocate sovereignty of the West Bank and Gaza between their respective States. Unearthing the past still remains the key to peacefully resolving the future. 'Monday night, on the upper east side of New York City, a gang of anti-Semitic "thugs" attacked a peaceful but visibly Jewish man – he was wearing a skullcap (a yarmulke or kippa). They also attacked his wife. Two cars "flying Palestinian flags and multiple motorcycles" pulled up to the couple at 8:00 p.m. while it was still daylight. 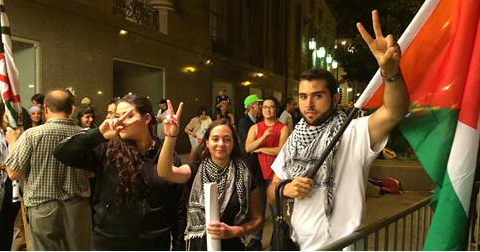 They began yelling "anti-Jewish statements." Then, they threw a water bottle that hit his wife, and, when her husband came to her defense, they "punched him in the head." The suspects fled. No arrests have been made. The 27-year-old man refused medical attention at the scene. This is my neighborhood, my home town. This incident took place about a mile away from where I live and work. So far, I have found only one brief article about this in the New York Post. Are there more such incidents that are not being covered? There are so many synagogues on the upper east side of New York City and so many visibly Jewish men and women. New York City's largest mosque is also on the upper east side. What are Jews supposed to do? Hide our faith – even as more and more Muslims in this very neighborhood proudly proclaim theirs by wearing hijab, burqas, Islamic skullcaps, and Islamic dress? Something is very wrong with this picture. Jews do not attack Muslims or Christians – or anyone for that matter – for wearing religiously identifiable clothing or jewelry. Only ​some ​Muslims ​appear ​do that – ​some ​Muslims or pro-Muslim sympathizers. Now, Jews everywhere are being held responsible for and hostage to Israeli acts of self-defense, which, alas, have been touted in the media as aggressive and genocidal acts. The media, the professoriate, international bodies, religious and political leaders have followed this lethal narrative for so long and so intensely that people really believe that Jews and Jewish Israel are evil and must be attacked on sight. By Australian Jewish News publisher Robert Magid in the latest issue, out today, a excellent op-ed entitled "The Media's True Lies" prompted by his recent visit to Britain, and the high levels of indignation at Israel's actions in Operation Protective Shield among the public there, prompting disturbances and discomfort for Jews. 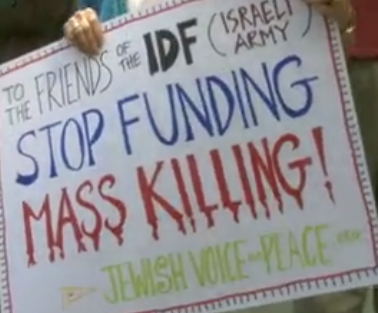 The conclusion we are to draw: "Israel bombs – innocent people die". What we have witnessed this month is [sic] the most slavish, most egregious examples of media manipulation which can only be described as propaganda: a Hollywood show, produced and directed by Hamas and performed by the corps of media producers, directors, journalists, freelancers and stringers presented verbatim from a script written by Hamas. '.... Why aren't we told about the manipulation of information such as the rearrangement of bodies for the cameras. Why do they keep repeating ... that according to the UN the overwhelming majority of the casualties are civilians? 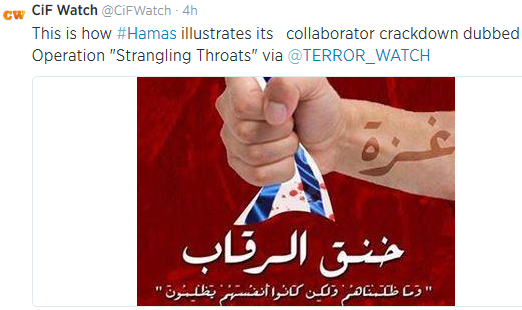 They know thatthe dubious information is provided by Hamas and the UN has no independent means of verifying it. 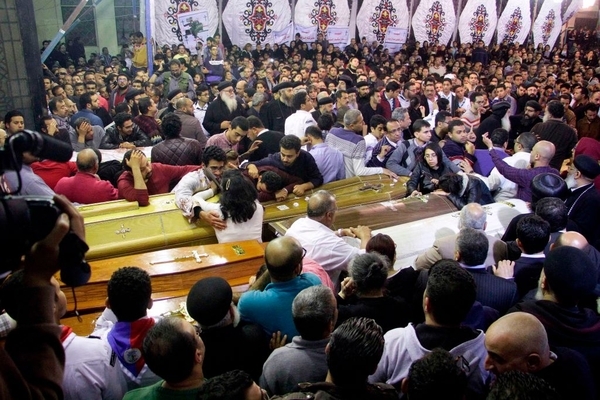 According to Israel's checks of the dead, a majority are combatants. Three cheers for this leading American Reform rabbi! 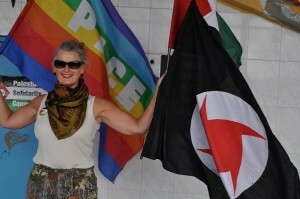 A British Islamist: "Only ISIS will help Palestine"
A Spanish Islamist: "Allah, Destroy the Plundering Jews, Do Not Spare a Single One"
What Makes The Welsh Greens' Leader "Think"
Flamboyant, statuesque and with a flair for courting the limelight, Pippa Bartolotti is leader of the Welsh Greens, and in May tried for a seat in the European Parliament. One of that monstrous regiment of liberated western feminists who for reasons best-known to themselves appear to prefer the Hamas misogynists to the gender-tolerant Israelis, she is known for her oft-expressed condemnation of Israel, and for her participation in the flotilla/flytilla stunts. And for this rant while in transit in Israel in 2011. On Facebook she's shared this video, of Gazans celebrating the new ceasefire, interpreted by them as a "victory" over Israel (So, h/t to Ms Bartolotti). Here's a nugget of naive and noisome nonsense that she's also posted on Facebook within the past twenty-four hours. Ms Bartolotti is by no means the first leftist Israel-basher to attempt to push an analogy between Anglo-Jews who have served in the IDF and Bristish Muslims who have flocked to the banners of extremist forces in the Middle East from the United Kingdom, "the Yemen of the West" as one journalist is calling it. 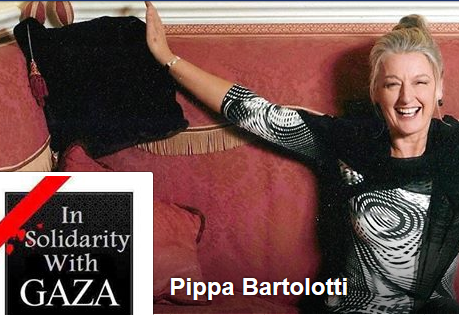 (I seem to recall that Stephen Sizer made a remark along those lines of Ms Bartolotti's on Facebook some time ago.) And I doubt she will be the last. It is, of course, utterly ridiculous to draw a parallel between Jews who have served in Israel's defensive wars and Muslims who have joined the ranks of Jihad. It is a false analogy that in today's antisemitic climate only serves further to demonise Anglo-Jews and of course Israel itself, and indeed to minimise the repellent preoccupations of the Britons fighting for ISIS. It marks a fresh low in the Left's ongoing crusade against Israel and Zionism and in the Left's inexplicable love affair with Islam and Islamists. 'We, the undersigned, are saddened by the devastating loss of life endured by Israelis and Palestinians in Gaza. 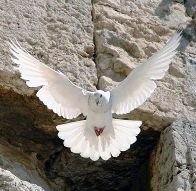 We are pained by the suffering on both sides of the conflict and hope for a solution that brings peace to the region. While we stand firm in our commitment to peace and justice, we must also stand firm against ideologies of hatred and genocide which are reflected in Hamas' charter, Article 7 of which reads, “There is a Jew hiding behind me, come on and kill him!” The son of a Hamas founder has also commented about the true nature of Hamas. 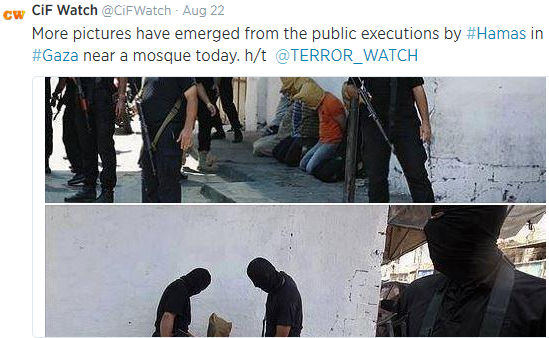 Hamas cannot be allowed to rain rockets on Israeli cities, nor can it be allowed to hold its own people hostage. Hospitals are for healing, not for hiding weapons. Schools are for learning, not for launching missiles. Children are our hope, not our human shields. 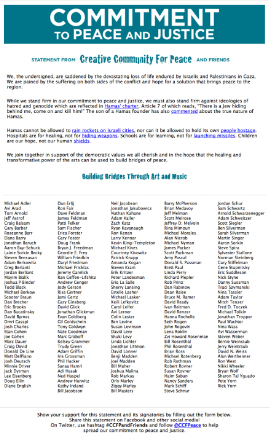 It's good to see people from the arts community, including Hollywood A-listers, speaking out against Hamas in this way. If only more, many many more, would nail their colours to the mast. What is particularly satisfying about the above list of signatories is that it includes Roseanne Barr, who has, if reports can be trusted, made some unpleasant references to Israel and Zionism in the past but who has been outspokenly supportive of Israel for some time . "The media in this country for a very long time has been contemptuous of Jews and contemptuous of Jewish life. [T]here's a deep-seated self-hatred, especially [among] the New York City elite media. Now, they might seem naive and innocuous enough, but these protesters (see the videos here and here and here and here) disrupting in relays a fundraising dinner for Israel at the Chicago Hilton on 21 August, at which the city's mayor Rahm Emanuel and Michael Oren (Israel's ex-ambassador to the United States) spoke, are representatives of an odious organisation which effectively gives aid and comfort to Hamas: the bizarrely-named "Jewish Voice For Peace" (JVP). 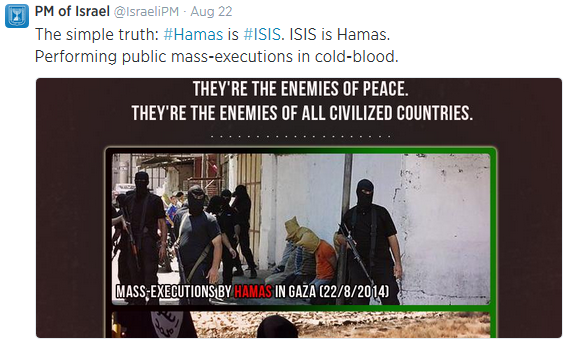 "Jews abetting Hamas are no voice for peace". Sinisterly, JVP keeps its source or sources of funding firmly under wraps; needless to say, if we knew who finances it we would know who pulls its strings. That’s it. 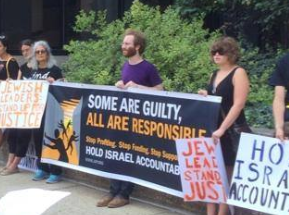 JVP seeks to divide American Jews—Israel’s main foundation of international support—so as to reduce or eliminate U.S. backing for Israel for the benefit of Israel’s enemies. JVP is part of the international NGO “soft power” war, whose unrelenting attacks on Israel’s right to self-defense ultimately aid Hamas. This global political warfare strategy includes sustained delegitimization campaigns, BDS (boycotts, divestment, and sanctions), and promoting a “right of return” for Palestinians, which means dismantling Israel as a Jewish and democratic state. "We are preparing for you an army you cannot match ... to die for the sake of Allah"
'On September 3rd the Frontline Club – with which the BBC frequently collaborates – will be hosting an event titled “Reporting the Israeli–Palestinian Conflict – Emotion, Bias and Objectivity” which we are informed is already fully booked. “The latest chapter in the Israeli–Palestinian conflict has again highlighted the difficulties of covering this complex and deep-rooted conflict that provokes such a strong emotional response from the general public. The BBC has faced accusation that it is not critical enough of Israel’s actions and that its reporting is one-sided, whereas Channel 4 News has been accused of crossing the line between journalism and campaigning. Is there a middle ground? In the face of such devastation should we expect correspondents to offer an objective view devoid of emotion? If we encourage correspondents to show more emotion do we risk compromising the credibility and standard of journalism in this country? On the panel selected to provide answers to those questions are Jeremy ‘I see no human shields’ Bowen and Channel 4’s Jon Snow. But it is not only regarding the existence of human shields in Gaza that the BBC has turned a blind eye. Beeboids (as the BiasedBBC website has long termed the Corporation's employees) have also chosen to ignore Hamas's similarities to Isis. The incorrigibly biased Jon Donnison (pictured) might well practise an Orla Guerin-like scowl. For Al Beeb's erstwhile correspondent in Gaza, who's now their man in Australia but who was flown back to his old stomping ground during the present crisis, where he proved just as one-sided as before, has received many a thoroughly deserved, humiliating thrashing from BBCWatch's Hadar Sela. That highly intelligent Israeli,with her thorough grounding in Israeli history and affairs, her sound knowledge of regional geopolitics, her gift for the written world, and her astuteness, has shown up Donnison's mediocrity, ignorance, and prejudice many times. Not that being shown up prevents Donnison from persisting in his offences against the BBC Charter and producers' guidelines or motivates his employer to rein him in. Nor did his egregious bias prevent him from winning a Radio Academy Silver Sony Award for radio journalism of the year for his coverage of the 2012 Gaza/Israel War. His bias is so overt and so pervasive that it is hardly surprising that some Israel supporters wonder whether this former reporter for BBC Radio Sheffield, who studied French and politics at the University of Edinburgh, was once a member of or influenced in some way by a Palestine Solidarity Campaign branch. Here's a man who could teach Danahar and Donnison much, the exiled Jordanian Palestinian leader Mudar Zahran, who's been visiting Bethlehem at some risk to himself. This brave pro-Israel figure (if you're on Facebook and/or Twitter please consider following him, for he deserves a wide audience) is a practising Muslim who pulls no punches in condemning the evil that Islamic extremists do. 'The clue to the intentions of Hamas is given in the Hamas Charter of 1988, a mixture of anti-Semitism and hatred of Israel. Using the Avalon Project translation of the Charter or Covenant, one can discern the stated objectives of Hamas. Only a few selections, sometimes in oblique language, are necessary to understand this. Israel will exist and will continue to exist until Islam will obliterate it, just as it obliterated others before it. Hamas (the Islamic Resistance Movement) strives to raise the banner of Allah over every inch of Palestine. The Day of Judgment will not come about until Muslims fight the Jews (killing the Jews), when the Jew will hide behind stones and trees. The stones and trees will say, "There is a Jew behind me; come and kill him." The Hamas Charter gives an answer to all the well-meaning groups and individuals who call for a peace conference. 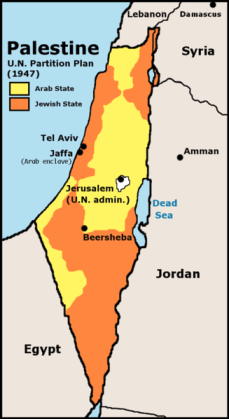 It declares that the land of Palestine is an Islamic Waqf consecrated for future Muslim generations until Judgment Day. Rejecting calls for an international conference to solve the “Palestinian” question, it declares that there is no solution for the Palestinian question except through jihad. Initiatives, proposals, and international conferences are all a waste of time and are vain endeavors. ....'Salafists believe that jihad must be performed under legitimate leadership.... Given that there is neither a legitimate leader nor a Salafist-approved declaration of jihad in Palestine, fighting there is forbidden. Salafists today see that their priority as fighting Shiites, “munafiqin” (dissemblers, or false Muslims) and apostates, whom they call the “close enemy.” During the current war in Gaza, a number of IS fighters have burned the Palestinian flag because they consider it a symbol of the decline of the Islamic world, which succumbed to national divisions through the creation of independent political states. In Salafist doctrine, the entire Islamic world must be united under a single state, an Islamic caliphate, which IS declared in late June. '....Along with the Muslim Brotherhood, [ISIS and Hamas] are Islamic extremist groups, violent in their ruthless pursuit of objectives – ISIS to create a caliphate empire, and Hamas to eliminate the State of Israel. The brutality of ISIS, now transformed into an Islamic state with a caliph, is apparent after its conquest of about a third of Syria, including the oil-rich eastern part, and much of north and central Iraq. Its ruthlessness and brutality are well-documented. That ruthlessness includes making decapitation an art form, executing dozens of Iraqi security forces, and cutting heads of Syrians. Though the Obama administration has not proposed this, the present conflict provides the opportunity for the existing semi-autonomous region of Kurdistan, set up in 2005, to be transformed into a Kurdish state, long overdue since promised by Britain and France in 1920. If the Western democracies appeared for too long to be unaware of the scale of the danger of Islamist ISIS, many, especially those in the mainstream media and the churches, seem equally oblivious to the real nature and danger of Hamas. Western public opinion, the media, and the academic world should recognize the existing struggle between an Islamist threat that would end the tolerance and civil liberties in the societies its forces might control, and democratic countries, with all their faults and problems, trying to resist that threat. "Hamas, We're Thinking Of You ..."
I know what this country is and I love it. I intend to live here all my life and die here ...And I am confident I will be left in peace to do that. Two things changed this. And the first was 9/11. When baffling events happen, planes coming out of a clear blue New York sky, people look for an explanation, a wrong that can be righted, an appeal that can be made to reason. And very often in history, the answer involves doing something about the Jews. I’m just saying. It does. [N]ow it would be unthinkable to organise a Jewish event of any kind without really quite strict security. My son goes to a Jewish primary school, as his brothers did before him. We have proper security there. My child goes to school behind several sets of very high, electronically controlled gates and bars, and a guard. None of the parents regards that as unnecessary. [M]uch anti-Zionism is entangled with antisemitism.... There is much that is antisemitic in intent and much that is antisemitic in effect. It is antisemitic to suggest that the world is being dominated by the great pariah state of Israel, defending its own interests through money and power. It is antisemitic to suggest that the “Zionists” control the media. It is antisemitic to elevate the conflict between Israel and the Palestinians high above all the wrongs being done, not least to Palestinians, by neighbouring states. 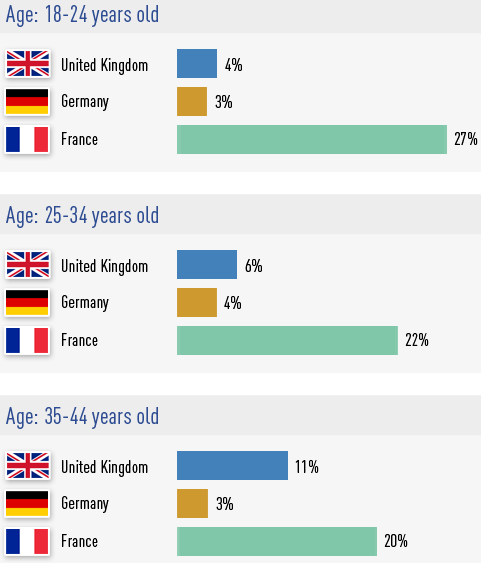 And when Jews see young men giving reverse Nazi salutes in France and protesting outside synagogues and harassing Jews, it’s no wonder we feel uncomfortable. And I worry — for the first time in my life, I do, I worry — about walking to synagogue on the Jewish new year. ....[M]ost of us Jews, wherever we are in the world, have a niggling feeling that perhaps it might be a good idea to keep a suitcase packed, and many of us have had, at least once, a conversation about where we would go if we had to. 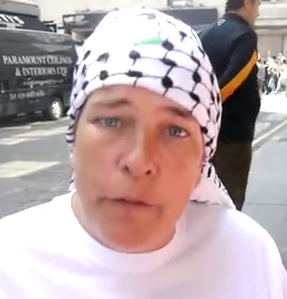 And watch here for middle-aged women, including some in the video above, as well as the deluded fan pictured above with her hair hidden under a keffiyeh) sending messages of support to terror group Hamas, whose only concept of equal opportunity for women is as suicide bombers, mothers of suicide bombers, and human shields! This, the latest article by Sydney lawyer and international affairs analyst David Singer, is entitled "Gaza – Australian Politicians Duped By Dud Declaration". The Canberra Declaration on Gaza signed by 77 current and former Federal and State parliamentarians [including former Liberal prime minister Malcolm Fraser] displays their total factual ignorance and political naiveté concerning the war raging between Hamas and Israel for the last six weeks. The Declaration has been “Published courtesy of Kohram”. Kohram is a 24/7 online Hindi and English News and Views website based in Delhi, India. It offers real information relating News Analysis, World Wide News, Politics, Entertainment, Technology, Sports, Industry and Feature Articles on Education. Khan was apparently unaware that in the five weeks preceding 8 July 234 rockets had been launched from Gaza into Israel reaching as far as Jerusalem, Tel Aviv and Hadera – sending hundreds of thousands of civilians scurrying into air raid shelters and disrupting normal life in Israel as well as threatening its tourist industry in the peak summer season. Long range rockets such as the M-302 were employed – the same missiles confiscated from the KLOS-C weapons seizure. Israel’s inherent entitlement to self-defence under article 51 of the United Nations Charter to prevent the indiscriminate firing of these rockets into Israeli population centres – each rocket an internationally acknowledged war crime – was not worth a mention in Khan’s article. 1. It claims to bear the signatures of members of Australian federal and state Parliaments – yet five of the 77 signatories are former members of those parliaments. The Declaration ignores any reference to Hamas having rejected a ceasefire deal proposed by Egypt on 16 July and accepted by Israel – and to a number of ceasefire agreements broken by Hamas since then. The Declaration ignored the findings of the 2011 United Nations Palmer Report which found that Israel’s naval blockade of Gaza complied with the requirements of international law and recommended that Israel should continue with its efforts to ease its restrictions on movement of goods and persons to and from Gaza in accordance with Security Council resolution 1860 – all aspects of which should be implemented. 4. The Declaration alleged that the rockets fired into Israel were “imprecise” and “cannot be compared with the broad-scale bombing of Gaza by Israel”. A grossly misleading allegation indeed – echoing Nakshab Khan’s spurious claim – considering Hamas rockets were landing all over Israel – whilst Israel’s response was limited to specific targeted areas within Gaza. “Collective punishment is not permitted under the Geneva conventions and is a war crime”. Whilst not specifically accusing Israel of perpetrating this crime, it is clear that the entire civilian population of Israel was being targeted by the broad-scale Hamas barrage of rockets – whilst large parts of Gaza’s civilian population were not being affected by Israel’s actions. 6. The Declaration claimed that hospitals and places of worship were among the Israeli military's targets – but ignored mentioning that such places were used to conceal underground tunnels and weapons and their use as command centres by Hamas. Why no pressure on Hamas – especially as Israel had agreed to end its military attack on Gaza three weeks previously and subsequently on a number of other occasions – only to see them broken by Hamas? 8. The Declaration – like Khan’s article - makes no mention of Israel’s inherent right of selfdefence. Those parliamentarians who signed this Declaration have some explaining to do to their constituents. I wrote to Senator Lee Rhiannon – one of two named parliamentarians to contact about signing this Declaration – requesting she comment on my criticisms of the Declaration. Regrettably at the time of writing this article no response has been received. Seventy-seven out of a possible 598 Federal and State politicians have signed – which attests to the savvy political acumen of those 521 who have refused to be duped by this dud Declaration. 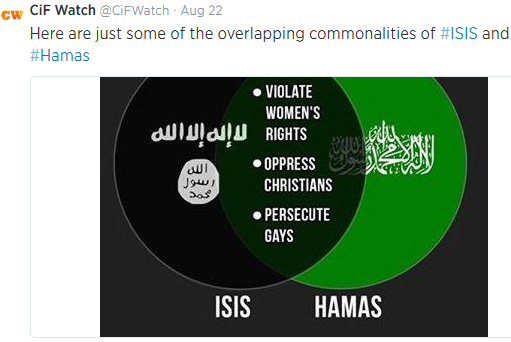 "Hamas Is Isis, Isis Is Hamas"